The capital of the Haute Matsiatra Region, Fianarantsoa is among the biggest and oldest cities in the country, and a top tourist destination in Madagascar. 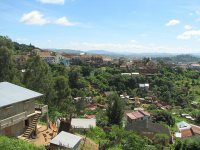 Fianarantsoa is the intellectual and cultural heart of Madagascar with a large university and many events and festivals, including the traditional Betsileo folk festivals held between May and September. The city is home to the oldest cathedrals in Madagascar (a mix of Protestant, Lutheran, and Catholic churches). Strolling around the colourful old town of Fiana, as the locals refer to it, is a great way to soak up Madagascan culture. Surrounded by vineyards, Fianarantsoa is also the wine capital of Madagascar. Although experienced wine tourists may be disappointed by the lack of polish of the wineries and shops in town, wine tasting in Madagascar is an increasingly popular activity. Maromby, just north of Fianarantsoa, is a quiet village with a monastery that offers a good selection of local wines. A popular excursion from the city is the attractive town of Ambalavao, in the Central Highlands. The town is well-known for paper-making, specialising in the Malagasy Antaimoro paper, made from papyrus and wild flowers. The paper is a popular souvenir from Madagascar, as is the silk produced at a factory in town. Those who travel to Ambavalao find it a thriving town with colourful buildings framed by elaborately-carved wooden balconies and tiled roofs. Intrepid Travel is one of the world's leading suppliers of small group adventures focused on getting off the beaten track and having real life experiences in Madagascar.